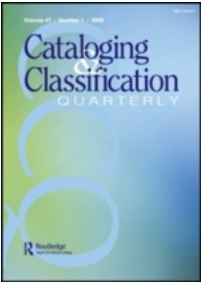 Jennifer Meekhof (MLIS '11), Senior Manager for Content at ProQuest, recently had an article published in Cataloging & Classification Quarterly. The article, entitled "Failure Modes and Effects Analysis (FMEA) for Cataloging: An Application and Evaluation" was written with co-author Amy Bailey, Head of Cataloging at Indiana University, Bloomington. The article can be found in Cataloging & Classification Quarterly, Vol. 55, No. 6. Failure Modes and Effects Analysis (FMEA) is a proactive assessment tool originally created for quality assurance in manufacturing industries. FMEA involves the assignment of rankings for frequency, severity, and detection of errors within a process. Catalogers at ProQuest undertook an innovative project to use FMEA to evaluate MARC record production. This article provides an overview of FMEA for process evaluation and summarizes an application for cataloging. It considers the tool's value for error-proofing in MARC record creation and how FMEA might be applied more effectively in a variable environment.